Join Free Online Event for Health Professionals Week Nov. 5-9! This is the seventh annual edition of our Alumni Newsletter. We want you to stay connected and informed about alumni, recent graduates, faculty and staff as well as news about your alma mater. Send us updates with your good news! Also, if you have a colleague, friend, or relative looking to gain their BSN? Make sure to tell them about your experience and recommend our program. With the national online track, students can enroll from anywhere in the country. Or, if you or someone else is looking to get their MSN, consider UW-Green Bay’s online Master of Science in Nursing (MSN) in Leadership and Management in Health Systems. We’re proud to present the third annual edition of our Alumni Newsletter. With this yearly publication, we will keep you informed on alumni, recent graduates, faculty and staff as well as news about your alma mater. Send us updates with your good news! Also, refer any RN’s who may be interested in our program. Students can enroll in the national online track from anywhere in the country! UW-Green Bay Hosts WITECNE Conference: The Professional Program in Nursing hosted an E-Learning in Nursing Conference April 7-8 as the culminating event of a 5 year Dept. of Health & Human Services, Health Resources and Services Administration (HRSA) grant to enhance educational technology in nursing courses. Historic Lambeau Field, home of the Super Bowl Champion Green Bay Packers was the site of the conference at which participants from across Wisconsin heard international keynote speaker Dr. Badrul Kahn speak about International and Cultural Perspectives in E-Learning. Dr. Diane Skiba from the University of Colorado discussed Emerging Technologies in Nursing Practice and E-Learning. The conference featured 17 other presenters and tours of the stadium. 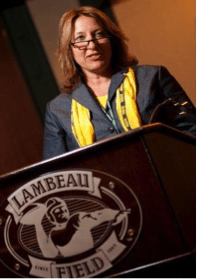 UW-Green Bay Assistant Professor, Dr. Janet Reilly presents Technology in E-Learning and Health in Nursing and the NFL as the opening address of the WITECNE (Wisconsin Technology Enhanced Collaboration Nursing Education) Conference. Technology is ubiquitous in healthcare. The grant assisted faculty at all five UW nursing programs to improve their knowledge and skills with informatics and healthcare technologies so that cutting edge content can be infused into nursing courses. 2010-2011 Grads: Summer of 2010 –Cristin Elsing, Stephanie Fouts, Susan Holtz, Tara Lorbetske-Cunha, David Pittman, Chad Sikora and Karen Tobin. Fall of 2010 – Tracy Anderson, Kimberly Bain, Daniel Blaha, Linda Denton, Maggie Fischer, Julie Fuller, Shenandoah Greenwood, Jay Griffin, Cynthia Heiberger, Jeanette Hilary, Deborah Holden, Kristen Holm, Sara Horkman, Trisha Kamps, Sarah Kaspari, Linda Keene, Ellen Knipfer, Lacey Kuehl, Linda Maxwell, Dawn McCullough, Angela Negri, Molly O’Neill, Sarah Ohrmundt, Joan Olson, Helene Salahud-Din, Barbara Seliger, Rebecca Sickels-Wahlers, Jerilou Stiles, Deborah Trossen, Jane Weber, Georgine Wood and Matthew Woodworth. 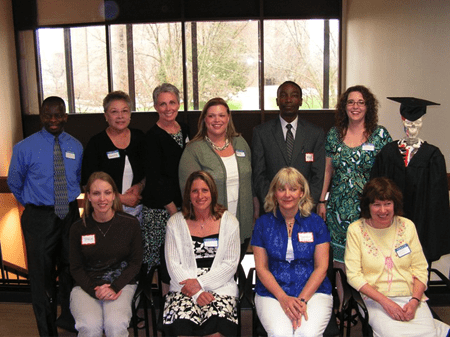 Spring of 2011 – Julie Baeten, Amy Bargander-Sullivan, Carrie Beck, Lorri Birkholz, Jessica Blahnik, Jamey Boucher, Bina Brandkamp, Rozanne Brehmer, Marcia Brodersen, Blaine Conley, Annette Dalka, Anne Earkes, Kelli Frederickson, Jennifer Friend, Amy Gatton, Sherri Glick, Erin Gorham, Dawn Gyrion, Tina Hafeman, Jennifer Hanoski, Leslie Lehrer, Heather Marker, Marci McDonald, Brenda Mroczynski, Stacie Murley, Moses Ngugi, Darcy Overman, Renee Payne, Lisa Radotich, Samantha Roche, Cortny Ruggles, Carol Sippel, Cathy Jo Strand, Marie Swartz, Ashley Topel, Brenda Vanden Langenberg, Nick Vanderbloomen, Wendy Wan, Roseanne Weber, Shelly Wickham, Amy Zabel and Cristiane Zacharias. Spring graduates attend nursing reception: Seated: Stacie Murley (WI), Amy Bargander-Sullivan (MN), Brenda Mroczynski (WI), Annette Dalka (WI). Standing: Andrew Phiri (MN), Brenda Vanden Langenberg (WI), Lori Birkholz (AL), Leslie Lehrer (WI), Moses Ngugi (MN), Heather Marker (MN), “Nursing Mascot Bones”. “Must Read” Recommendations from Faculty: Dr. Janet Reilly recommends “M y Stroke of Insight” by Harvard neuroscientist Dr. Jill Bolte Taylor. It’s a short read that details physiology of left and right brain function and the author’s experience with a stroke at age 37. Dr. Derryl Block recommends a fun article about the nurse’s cap titled: “What Happened to the Cap? The Dawn of the Cap.” Click the following link (free log-in/password required): http://www.medscape.com/viewarticle/741581. Alumni Welcome to Join Travel Trip to Mexico: The third annual Study Abroad Trip to Cuernavaca, Mexico will be led by Dr. Christine Vandenhouten. Tentative dates are January 2-16, 2012. Participants will learn about the Mexican healthcare system with excursions to public, private and rural hospitals. Visits to important cultural sites will be included. Cuernavaca is a beautiful city, dubbed the City of Eternal Spring, for its temperate climate. It is located about 90 minutes from Mexico City. There is no language requirement for this travel course. Alumni will need to complete applications as “Special Students” to take this course. All participants need to have passports. The exact cost and final details will be available soon. Contact Ruth Pearson (920-465-2826 or pearsonr@uwgb.edu) if you are interested in this exciting opportunity. More International: Collaboration with our partner Universidad Nacional de Tumbes in Peru resulted in a real-time videoconference in March. Dr. Christine Vandenhouten led nursing students from both campuses in discussions about healthcare, nursing and nursing education. Peruvian nursing students shared that they attend classes for 5 years, followed by a 1 year internship. Their typical patient load is about 30-40 patients per one nurse, compared to 5-10 in the US. For more information, click: http://blog.uwgb.edu/inside/index.php/featured/leading-learning/04/06/global-learning-nursing-peru/. An earlier course combining our students with the Peruvian students ran during Fall of 2010 titled “Nursing Diagnosis Across the Globe”. The course featured guest instructor Heather Herdman, PhD., Executive Director of NANDA International. Mark Hunter and Tracy LaRock were notified this spring that their work in revising nursing diagnoses was accepted for publication in the upcoming NANDA International Nursing Diagnosis: Definitions & Classification 2012-2014. Mark revised the Risk for Infection diagnosis and Tracy revised the Powerlessness and Risk for Powerlessness diagnoses. Tracy and Mark were students in the Fall 2010 Nursing Diagnosis and Functional Health Patterns course instructed by Heather Herdman, Executive Director of NANDA-I and Susan Gallagher-Lepak, Associate Professor at UW-Green Bay. Dr. Derryl Block returns this summer as Chair of Nursing after serving as Interim Dean of Professional & Graduate Studies since 2009. Lecturer Brenda Tyczkowski: Authorization to plan a new online collaborative program in Health Information Management Technology (HIMT) has been granted by UW System. Brenda Tyczkowski has taken a lead role. Associate Lecturer Rebecca Hovarter has taken a new position as of 7-11-11 as Health Officer/Public Health Director at Shawano Co. Health Dept. Congratulations Becky! Mary (Podoski) Rosner (2003) has taken a position in Public Health with Marinette Co. (WI) after being with Oconto Co. for 5 ½ years. Congratulations Mary! Carlene (Farber) Lange (2008) was recognized this past year for 25 years of employment with the State of Minnesota in adult mental health. Congratulations on this milestone! Lorri Birkholz (2011) co-authored an article published in the Journal of Nursing Education titled “Using Distance Technology to Learn Across Borders: A Virtual Travel Course in Nursing” with Peruvian student Carlos Christian Melgar Moran, Peruvian Professor Yrene Esperanza Urbina Rojas, and UW-Green Bay Professors Derryl Block and Susan Gallagher-Lepak. Crystal Malakar (2009) participated in the “Posters in the Rotunda” event this April at the Wisconsin State Capital. Students from UW campuses showcased their scholarship and interacted with legislators. Crystal conducted research with the team of Drs. Mimi Kubsch, Derryl Block, Susan Gallagher-Lepak and Chris Vandenhouten. Crystal’s research originated in Dr. Kubsch’s Nursing Research Course and developed into a survey of 500 plus RN’s to document the level of, and the factors which influence political involvement. Psychological engagement (political interest, efficacy, and information) and greater resources (time and money & civic skills) were most predictive of political participation. Click on the above link to the Professional Program in Nursing Facebook page which we launched this winter. It serves as a vehicle for prospective students to find out about us, a resource to existing students, and a great way for alumni to stay in touch with our program. Plus, it allows for some fun updates about our campus and community. Sign-up for Facebook, find the University of Wisconsin-Green Bay RN to BSN Program, and be sure to “Like” us! “Bones” Dresses for the Super Bowl! ‘The Nursing Skeleton,’ normally and previously a dignified teaching device, was decked out in Green Bay Packers gear as the Super Bowl approached. His “spirit” helped to spur the Packers to victory! 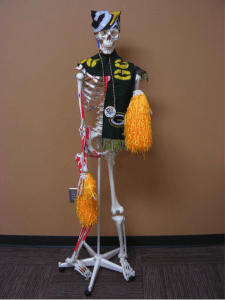 Bones, a plastic skeleton, is regularly on display at the Professional Program in Nursing suite on the third floor of Rose Hall and is commonly featured on the Professional Program in Nursing’s Facebook page. We want to hear from you: Please tell us of your professional accomplishments including new jobs, publications, successes at work, degrees after graduation, etc. Please send information updates to: nursing@uwgb.edu. We’re proud to present the second annual edition of our Alumni Newsletter. With this yearly publication, we will keep you informed on alumni, recent graduates, faculty and staff as well as news about your alma mater. Send us updates with your good news! Also, refer any RN’s who may be interested in our program. Students can enroll in the national online track from anywhere in the country! After being a nurse for 22 years, Beth Jacobs worried whether she would be a successful student if she returned to school. She questioned why having a course like Western Civilization would be helpful as a nurse and whether she could compete with younger students. Four years and 60 credits later, she finished the BSN-LINC Program with a nearly 4.0 average while taking online classes from her home in Ohio. Spring 2010 graduate, Beth Jacobs visits the Nursing Lab with Dr. Gallagher–Lepak to see Super Chloe, our Patient Care Simulator manikin. Beth visited campus for the first time to attend the graduation ceremony. During her stay, she shared how she highly recommends our program, mentioning how supportive the faculty and advisors have been. She realizes how the general education courses advanced her understanding of others and her ability to be a better nurse. Beth hopes to return to school for her Masters in the near future. Keep us posted Beth! Summer of 2009 – Charlotte Ahrens, Holly Barta, Sarah Cherek, and Jodi Space. Fall of 2009 – Christina Almeida-Kerwin, Greg Barron, Tanya Comyne, Paual Ferron, Margaret Gerwels, Marcia Hermann, Susan Hilsabeck, Martha Krasean, Kimberly Krueger, Crystal Malakar, Kelly Marks, Diane Milson, Sarah Mueller, Ashley Novotny, Kimberly Oninski, Leana Peterson-Leaf, Stanley Sadenwasser, Todd Schmadl, Diane Schubert, Amber Seidler, Stacey Strong, CoraLeah VandenAvond and Valerie Verbist. Spring of 2010 – Theresa Bilse-Kraft, Carol Cardamone, Chris Charlier, Christine Dahl, Molly Dahlke, Sara DeBauch, Nicole Fedele, Brian Gaspar, Crystal Guns, Stephanie Harju, Stacy Hartlaub, Diane Haszel, Janice Homer, Elizabeth Jacobs, Heather Kalm, Nicole Mann, Michelle Marg, Kim McAllister, Treena Messerschmidt, Jodi Romang, Susan Tebes, Kimberly Thiry, Janette Traurig and Sarah Welter. Congratulations to all of our graduates. Crystalline Malakar was recognized as a Fall 2009 recipient of the Chancellor’s Medallion for academic excellence and leadership while at UW-Green Bay. 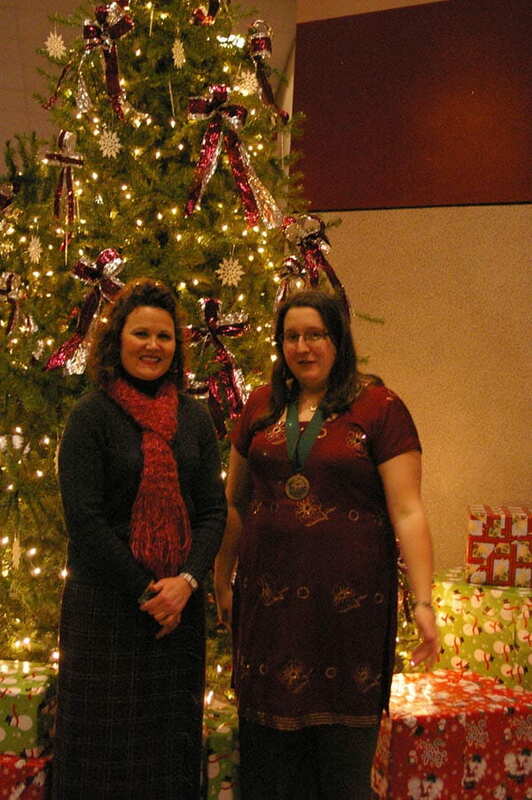 Crystal is pictured below (left) with Dr. Vandenhouten (right) at an awards ceremony. For a second consecutive year, the Professional Program in Nursing will offer RN to BSN students and alumni a travel course to Cuernavaca, Mexico. This 3 week travel course will run from December 27, 2010 – January 17, 2011 (including New Years Eve in Mexico!). Students will learn about Mexican culture and healthcare and take Spanish language immersion classes (tailored to your level of language proficiency). Language class will occur each morning. Afternoons will be spent with speakers and field trips related to culture and healthcare. Cuernavaca is a beautiful city, dubbed the City of Eternal Spring, for its temperate climate. It is located about 90 minutes from Mexico City. There is no language requirement for this travel course. Alumni will need to complete an application as “Special Students” to take this course. All participants need to have passports. The exact cost and final details will be available soon. (Anticipated total cost is about $3000.) Contact Ruth Pearson (920-465-2826 or pearsonr@uwgb.edu) if you are interested in this exciting opportunity. Drs. Derryl Block and Susan Gallagher-Lepak offered an online course in Spring with students from Universidad Nacional de Tumbes in Peru and UW-Green Bay. Communications were posted in both Spanish and English. (Thank goodness for “Google Translate”!) Another course will run Fall of 2010 titled “Nursing Diagnosis Across the Globe”. The course will feature guest instructor Heather Herdman, PhD., Executive Director of NANDA International. For information, please contact Jennifer Schwahn at schwahnj@uwgb.edu. Drs. Janet Reilly and Susan Gallagher-Lepak travelled to Finland in May of 2009 as part of an interdisciplinary team from UW-Green Bay. 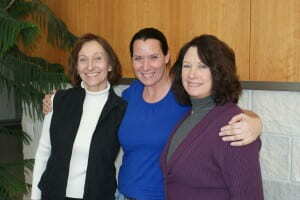 They met with education and nursing professionals and hosted a group from Finland at UW-Green Bay in October, 2009. Discussions centered on international nursing and healthcare in Finland. Dr. Derryl Block was named the Interim Dean of the School of Professional & Graduate Studies in July of 2009. Dr. Susan Gallagher-Lepak was named the Interim Chair of Nursing in July, 2009. She was promoted with tenure to Associate Professor in June, 2010. Dr. Mary Jo DeVillers was awarded the degree of Doctor of Philosophy (Ph.D), from the Loyola University Chicago Nursing Program in July 2010. Dr. Christine Vandenhouten was elected to the National Board of Directors of the Association of Community Health Educators. She also presented at the June Annual Conference and serves as the editor of the web based members resource Innovative Teaching Strategies. Lecturer Brenda Tyczkowski is currently enrolled in the Doctorate of Nursing Practice Program at Kansas University Medical Center. Instructor Rebecca Hovarter received the APHN RNBC credentials after passing the ANCC Advanced Public Health Nurse exam in Fall of 2009. Dr. Mimi Kubsch: Our heartfelt condolences to Mimi whose husband passed away unexpectedly in December of 2009. Andi (Vierck) Foley (2000) completed her MSN in 2008 from St. Joseph’s College in Maine. She returned to school for her CNS certificate from Florida Southern College and is an Education Specialist for Lakeland Regional Medical Center in Lakeland, FL. Fay (Schmitz) Fritsch (2006) graduated from UW-Oshkosh, Family Nurse Practitioner Program and passed her APNP exam in summer of 2009. Fay is employed by Green Bay Emergency Medical Services. Carol (Coapman) Miles (2006) continues to be active with Vital Links for Humanity, having been in Ho Chi Minh City in Vietnam from June 1-16, 2010. The team from Vital Links delivered needed medical equipment, supplies and textbooks. They also secured grant funding for a new dining room for a handicapped orphanage and had three pharmacy students join them to present classes on Infection Control, Medication Safety and Medical Terminology. The students brought donated resuscitators and school supplies. Carol, keep up the good work! Bernadette Simon (2003) recently came to campus as a volunteer for her daughter, Jennifer Wilson who is a current student in the Health Assessment Class instructed by Dr. Mimi Kubsch. Jennifer works at Bellin Hospital Maternity unit in Green Bay and has 3 children. Bernadette is a nursing supervisor at St. Vincent’s Hospital in Green Bay and has 22 grandchildren. Dr. Kubsch taught both mother and daughter. The three are pictured below, Bernadette (left), Jennifer (center) and Dr. Kubsch (right).